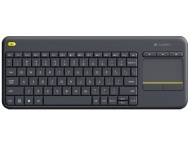 alaTest has collected and analyzed 1758 reviews of Logitech Wireless Touch K400 Plus. The average rating for this product is 4.5/5, compared to an average rating of 4.1/5 for other products in the same category for all reviews. Reviewers are impressed by the durability and design. The price and size also get good views. We analyzed user and expert ratings, product age and more factors. Compared to other products in the same category the Logitech Wireless Touch K400 Plus is awarded an overall alaScore™ of 90/100 = Excellent quality. The K400 Plus will be available in the US in June, and worldwide in July. You can preorder it now on Logitech's site. Very slim and usual! All you need for your stream and control your tv! Well I bought this keyboard thinking it would help with typing for searches in Netflix and Amazon Prime. Still had to use arrow keys and type one letter at a time with onscreen keyboard. Still better than using the remote for searches. Gotta be patient. Needed this for streaming on my computer/tv. It worked perfectly out of the box and a real value. I like that it is lightweight and has a volume adjustment on the board. I have several computers for my desk, each with their own monitor and keyboard. By using this product, I was able to eliminate the wires and have more space on my desk. Makes everything so much easier! I can sit comfortably and work easier. I love the mobility and functionality of this keyboard. I use it for my Surface Pro 3 at work, my Macbook at home and my iPhone. It's an awesome lightweight keyboard and I would recommend it to anyone looking for something similar.